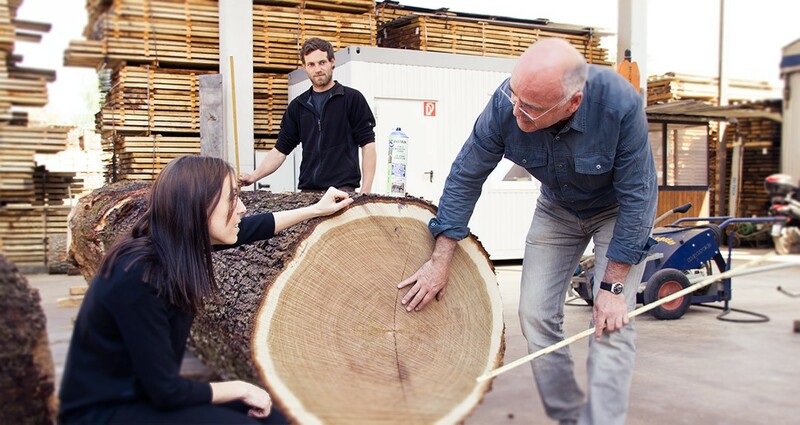 Our log buyers Richard Weis, Walter Künzinger, Yannic Fischer and Stephanie Weis examine and classify every log prior to purchase. For this, they are traveling all over Germany, France and Austria during the buying season. 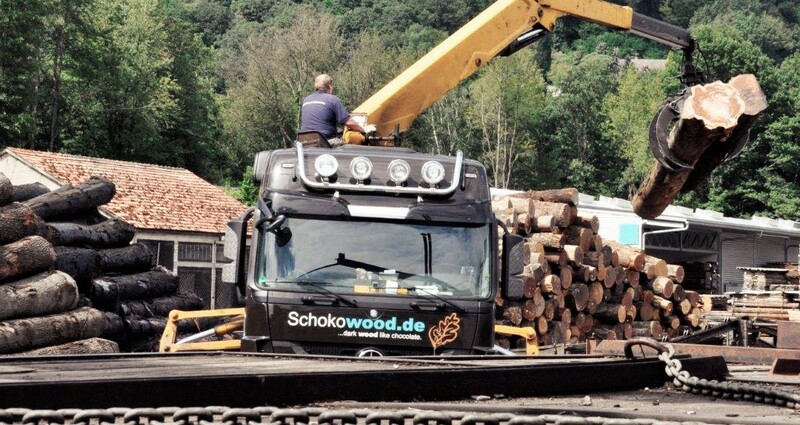 The trunks for which Mehling & Wiesmann received the bid acceptance are collected from the forests and brought to our log yard. 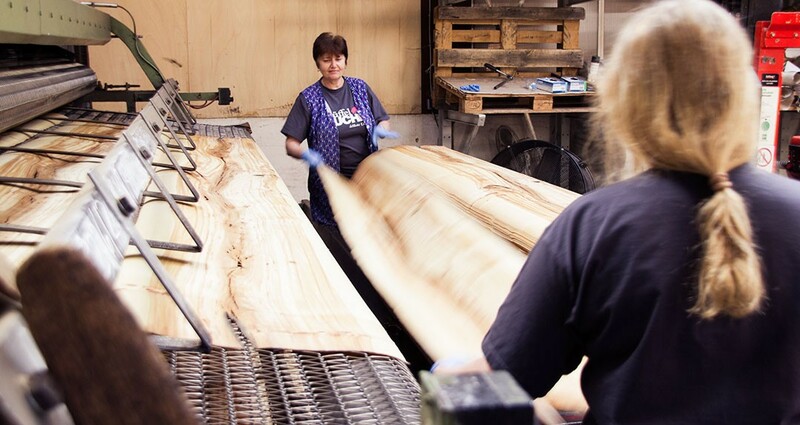 We continuously sprinkle the quality timber with water so that it remains moist. So we are able to prevent changes in color and cracking of the wood. 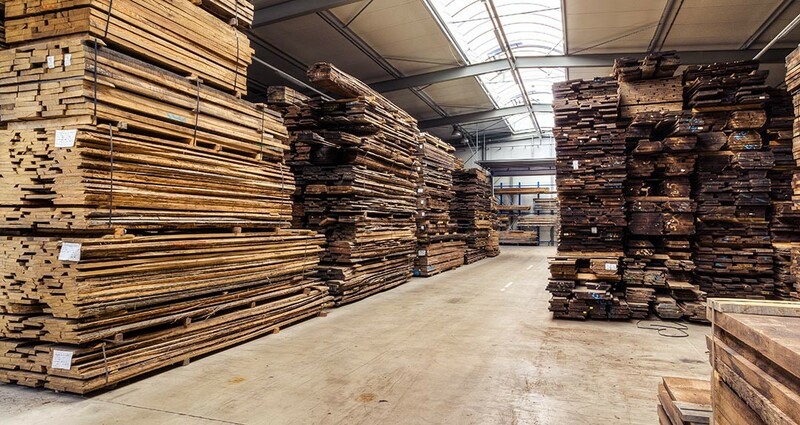 Here, our wood experts decide on the further processing of the logs into veneers, sawn timber or tabletops. Moreover, the logs are marked for subsequent sawing. 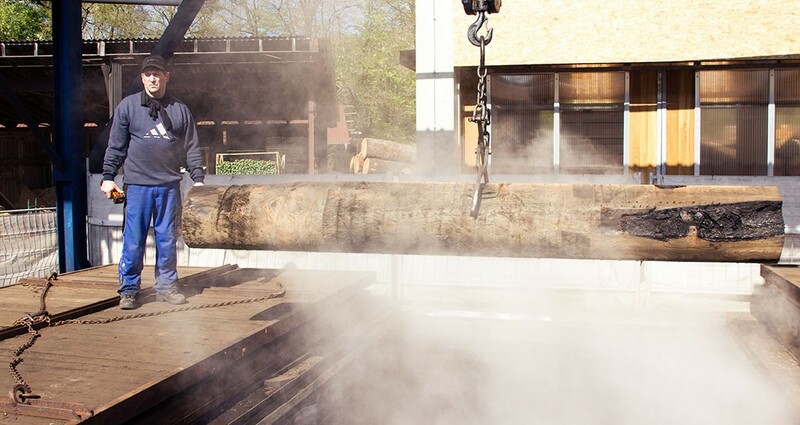 Our chief Elmar Wendel dips the debarked logs into the steaming pits filled with hot water. 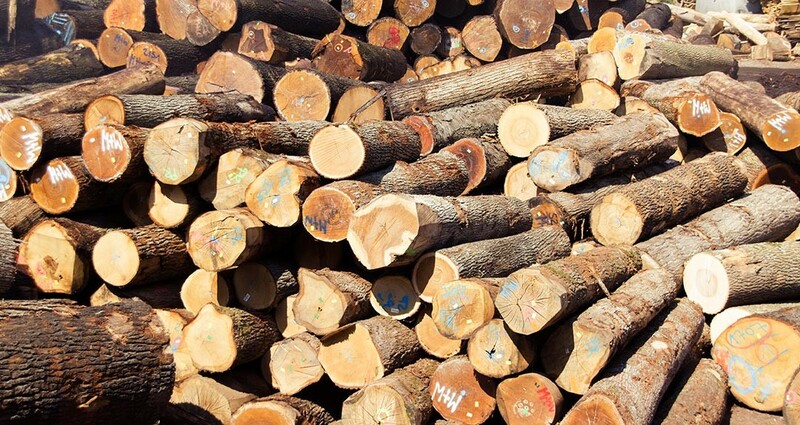 There, the logs are cooking or steaming several days in order to achieve the necessary pliability for a smooth cut on the slicing machine. On top of this, we herewith also influence the color of the veneer. 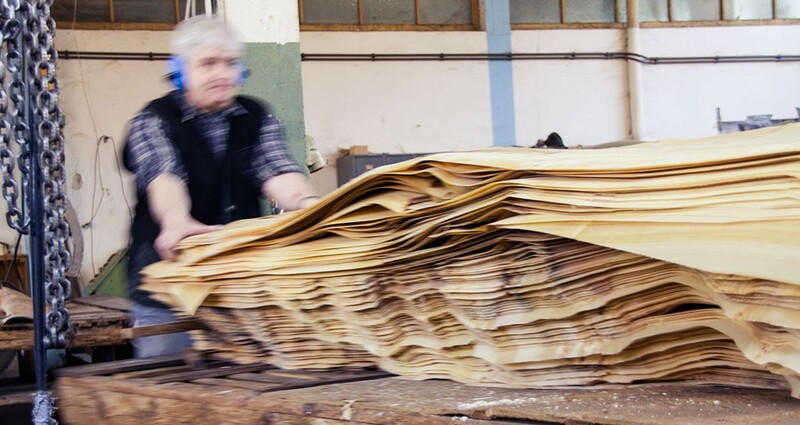 With two slicing machines we cut the wood into thin layers of 0.6 – 4.5mm. Our experienced operators are real masters on the machines and adjust them exactly. This requires precise work, experience and it is a matter of millimeters. Only this way we obtain first-class quality we stand for. 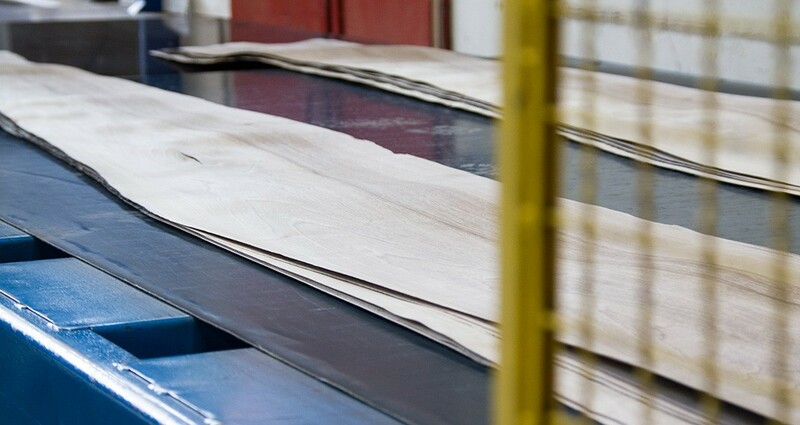 The wet veneers are dried in huge belt dryers with different temperatures and throughput times. In particular the mild, light Spessart oak and the thick veneers prefer traditional air drying. We are superbly equipped with our highly efficient air dryer. Our experience and our staff. A thru-feed press smoothes the veneers and simplifies further processing. When the veneers are dry they are properly bundled and cut. The edges are straightened. 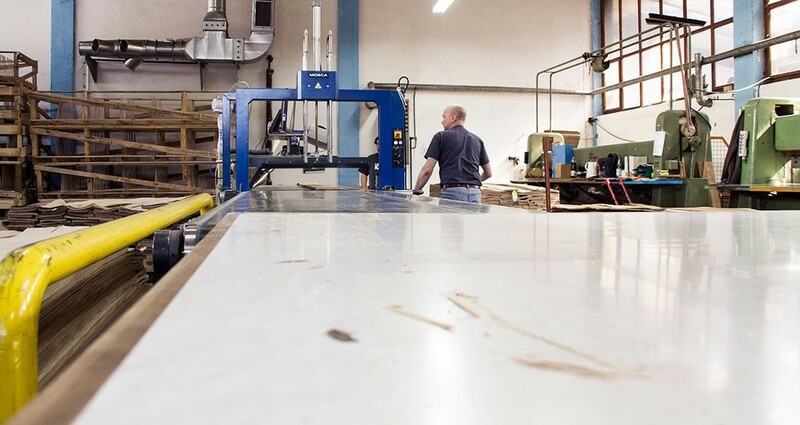 At the heart of our business, our veneer vendors Bastian Rockenmaier and Elias Dörringer sort the veneers in terms of qualities, lengths and types of wood with their team on a fully automatic, millimeter-accurate measurement and photographing line. Often, there is already a customer-specific grading with regard to. The bundles are labeled and stored in pallets.